Trim the tree, light the lights and serve up some delicious holiday treats for your family! December is a time when the world, in its frantic rush to find meaning, joins together to celebrate the birth of a baby who came to save the world. Whether you say, "Joyeux Noel" or "Sretan Bozic" or "Krismasi Njema", the meaning is the same... We wish you a Merry Christmas! Celebrate with the world by serving some delicious Christmas recipes this December. When you sign up for the free twice-monthly Knowledge Quest newsletter, you will receive Figgy Pudding, Stollen and Tamales absolutely free. A Gift for You... A Gift for Them! When we reach 40,000 subscribers to the Knowledge Quest newsletter (we have 38,700 now), we'll give a family a pair of goats which will provide "milk, meat and a message of HOPE" to a family in Asia. When we reach 41,000 subscribers, in addition to the above, we'll give another family a water buffalo! When we reach 42,000 subscribers, in addition to the above, we'll give a whole barn full of animals - 3 pairs of chickens, a pair of goats, one lamb, one cow and a pair of pigs - to a third family! When we reach 45,000 subscribers, we'll provide a water well for a whole community! And yes, this is doable! We did it last year and gave a rickshaw to a hard-working family man in India! How? Because everyone who subscribes to our newsletter gets the free Christmas cookbook - Figgy Pudding, Stollen and Tamales. So that means a gift for you and a gift for them. It's a win-win-win Christmas celebration! Join us by spreading the word about Knowledge Quest to your friends this Christmas season. Friends can sign up for the newsletter on this web page and then they can download the cookbook right away. And may God bless you for your kindness and generous spirit. 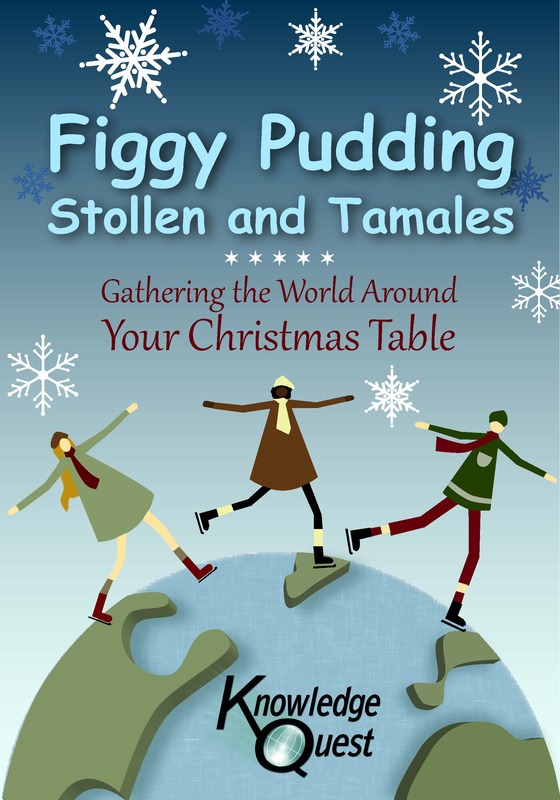 Share Figgy Pudding, Stollen and Tamales with your friends and give gifts to the needy this holiday season! Merry Christmas!